Most major American airlines have been playing around with offering additional fare classes on their flights since a few years ago. While Economy Plus tends to receive a lot of attention for offering travelers an upgraded Economy seat that won’t set them back their monthly wages, Basic Economy – the lower end of Economy seats – serves travelers who don’t mind giving up some of the perks of a standard economy fare. 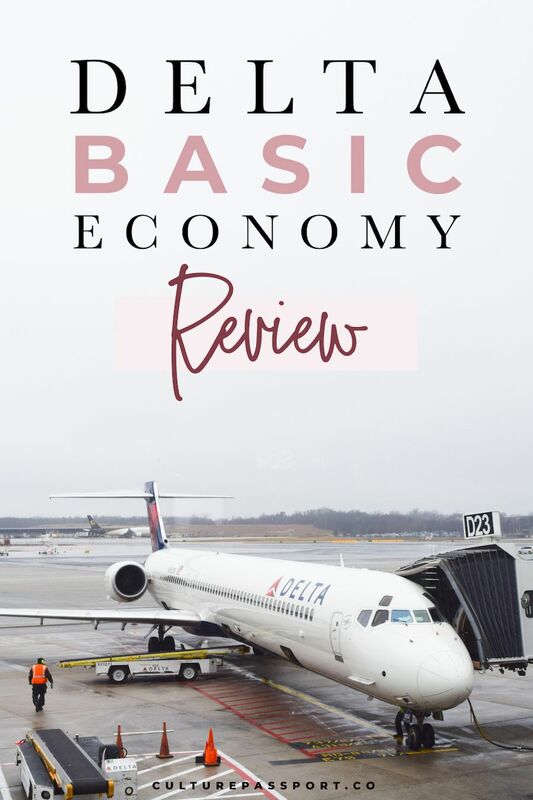 Nearly all airlines in the United States now have some form of Basic Economy fares, and I’m going to share my experience flying Delta Basic Economy on a domestic flight and on an international flight shortly afterwards. First, let’s go over some of the main differences between a Delta Basic Economy ticket and a Main Cabin seat, in case you’re not familiar with them. Despite the wording, both Delta Basic Economy and Delta Main Cabin seats are in the same physical Economy cabin of the plane. There is no visual difference between the actual seats, nor the level of service in terms of food and beverages. You can still bring one carry-on and one personal item aboard free of charge on either fare. None of these drawbacks were dealbreakers for me, so I booked two trips using Delta’s Basic Economy fares. The first was a domestic trip to Texas and the second was an international trip to Paris. Here is how I fared (no pun intended!) with Basic Economy on each trip! The domestic flight I booked was for two people flying from Washington DC (Dulles) to San Antonio, Texas, with a stopover in Atlanta, Delta’s hub. It’s worth noting that I have Silver Medallion status but I’ll be sure to share where my experience differed from the typical one so you know what to expect whether you have Status or not. So, at exactly 24 hours before my flight, it was time to check in. I did this right away so I could reserve the best two seats possible. I reserved two seats next to each other on the first leg with no problem. When it came to the second leg, I could not reserve seats at all. Booo! This is what’s unclear from Delta’s disclaimer at the time of booking: According to them, you should be able to choose your seat as you check in. In my experience, I couldn’t choose seats for both flights. Ironically, I was able to choose seats on the smaller flight, and not on the larger one. The first flight was seated 2-3 and the second flight was seated 3-3. I finished checking in and received my boarding passes for the two flights. Out of curiosity I clicked “View Upgrade / Standby List” in the Delta “My Trips” portion of the website, and to my surprise, our names were listed as “Standby.” What?! I was shocked that Delta had put my booking on “Standby” and knew I had to reach out to them. I called Delta using the Medallion Status Customer Service number right after noticing this. Almost immediately, the gate agent was able to assign us two seats, which was a big relief. Once I got the two seats, I could see there were other empty seats in the middle row available, so I’m pretty surprised that Delta would list us as “Standby” when we clearly were not. The bad news was that both the seats were middle seats, one in front of the other. The Delta representative said we could ask the gate agent tomorrow to assign us seats next to each other, but she could not as the flight was full. At least we had seats, in any case! The Delta Basic Economy carry on luggage policy is the same as your standard fare: you get one carry-on baggage allowance (a suitcase), and one personal item (typically a purse or laptop). Checking bags come at an additional cost. I did not check bags on this particular flight, but the policy was clear that there would be no free checked bags on this fare. That being said, because I have Silver Medallion status, I would have received my first checked bag free if I needed it, even on the Basic Economy ticket! With a Basic Economy Fare, you will be the last to board the plane. Luckily, because of my Silver Medallion Status though, I was able to board in the MAIN1 group of travelers. Delta boards First Class, Sky Priority, Economy Plus, and finally Economy tickets. Within Economy you have MAIN1, MAIN2, MAIN3, and finally BASIC. That’s what they call the boarding groups now! I noticed that a group of people waiting across from me were flying on the Delta Basic Economy tickets, and sure enough they boarded last. That’s how I know that my Silver Medallion Status was the only reason I was bumped up in the boarding groups. As mentioned earlier, there are no in-flight differences between the fares. You cannot tell who is flying Basic Economy and who is flying Main Cabin Economy once everyone is seated. The majority of the differences were all pre-boarding. My next trip flying with Delta Basic Economy was just one week after my arrival back home. This time, I was flying internationally, from JFK in New York to CDG in Paris! The process remained mostly the same ahead of my flight. I was not able to select my seat until the moment of check-in. According to Delta, I cannot check in until 24 hours before my flight, however because this flight was operated by Air France, I could check in 30 hours before my flight, and that’s exactly what I did. I was able to get a seat towards the beginning of the economy section (22A) near a window as I prefer. Premium economy ended at row 20 according to my seating plan at check-in. Not a bad seat! Oddly, once I got to the airport, I checked my suitcase in (a benefit to having Silver Medallion status with Delta) and I received a boarding pass with a different seat assigned than what I had selected. This seat was 26A. Still a window, I assumed since it was still in column A so I didn’t make much of it. I was assigned to boarding group Zone 3. On Air France flights, you have Zone 1 (First & Business Class) and 2 (Sky Priority & Premium Economy), followed by Groups 3, 4 and 5, which are the Economy fares. I was assigned to Group 3, likely due to my Silver Medallion Status with Delta. Once I got to the boarding gate, my name was called for a passport check. I assumed because this was my first Air France flight since renewing my passport and they wanted to make sure all was in order. Much to my surprise, I got to the gate agent desk, and she informed me I had been upgraded to Premium Economy! I even got to stay in my coveted window seat in Premium Economy. Keep in mind: the only reason I was upgraded was likely because I had Silver Medallion status with Delta. I don’t believe this would be a typical “Basic Economy” fare experience without any sort of airline status. I was also bumped up to Zone 2 boarding that came along with my upgrade. As I mentioned earlier, my original ticket put me in Zone 3 boarding. There were about 2 people in that line, and the rest were lined up in Zones 4 & 5. My guess is that Zone 3 is for partner airline Status holders (ie. Delta in my case). So if you book a Basic Economy Fare without status, you should reasonably expect to board in Zones 4 or 5. I’m really surprised I was upgraded because the Basic Economy Fare rule ares are quite straightforward: no paid or complimentary upgrades. As I mentioned, I selected seat 22A at the time of check-in, which was the forwardmost window seat I could select. When I got on the plane, I noticed the last row of Premium Economy was 21. The next row jumped to 23, where normal Economy seats began. I’m wondering if perhaps there was a last minute plane adjustment for my flight resulting in some seats being off and I just happened to get bumped due to my row being missing! It remains a mystery to me but I wasn’t about to turn the upgrade away. All in all, I’m confident that the worst case scenario would be to get stuck in a middle seat during the flight on a Basic Economy fare. But then again, if you check in at 24 hours prior to your flight (or as early as you can), you should be able to select a good seat you like. If I had not been upgraded, I still would have been in a comfortable window seat, at a discounted price! I probably would have boarded last, but I did not have a carry-on suitcase, so access to the overhead bins wasn’t a priority for me this time around. For that reason, I definitely recommend purchasing a Basic Economy fare if you are on the fence and are a flexible traveler without high expectations!